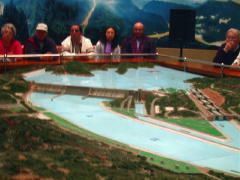 The Three Gorges Project (TGP) is the largest water conservancy project in the world. The dam site is about 38 km upstream of the existing Gezhouba Project (locks). The TGP consists of a dam, two powerhouses, and permanent navigation facilities. The concrete gravity dam has a length of about 2,300 meters (1.4 miles) with a crest elevation of 185 meters (600 feet). There are 26 hydro turbine generators that can produce 18.2GW of energy. The estimated cost is 203.9 billion Yuan ($40 billion US). The 17 year long project is divided into three stages: dam site preparation 1993-1997, dam construction 1998-2003, and reservoir filling 2003-2009. The navigation portion of the project provides for both a 5 stage lock ship lock, that will take 4-6 hours to transit, and a ship elevator that will only require about 30 minutes to move smaller vessels up and down the 185 meter dam height. There are several reasons for building the dam, but chief among them is to provide a navigable route for ocean going vessels between China's industrial heart in Chongqing and the China Sea mouth of the Yangtze's mouth at Shanghai. China also needed the electrical power and the flood control provided by the dam. There is an excellent Discovery Channel program on the dam that is worth watching to being to understand the scope of this project. Over 100 million people will be displaced by the rising waters, that's nearly half the population of the United States. 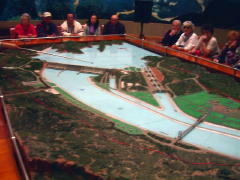 Our visit to the Three Gorges Exhibit Hall, where the dam models are located, was all too brief. Also, I was disappointed that most of the exhibits lacked an English translation of the descriptions. We had more than ample time at the dam overlook site, Tanziling, but due to the ever present haze and smog the viewing was poor. It made me wonder when the professional photographs of the dam construction were taken? Although I noted more than a few of these photos also showed the haze and smog. My special thanks to Gloria Heemer, fellow OAT traveler and very nice lady, who most graciously loaned me her "Brief Introduction to the Three Gorges Project Construction" booklet from which several of the professional images, and the above dam facts, are taken. 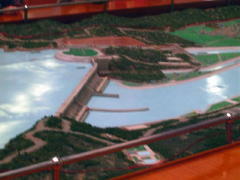 The Gezhouba Project is the first dam across the Yangtze River. The dam is 2.5 km in length and has a height of 70 meters. The project consists of hydro electric power generation, ship locks and sluice gates. The project is located about 38 km downstream of the TGP dam site. There are three ship locks, two are among the largest in the world at 34 meters wide and 280 meters in length. The Three Gorges Expressway Project is a roadway that follows the Yangtze River from the dam site to Chongqing. It has 34 bridges and 5 double-bore tunnels including the 3.6 km long Muyucao Tunnel. We saw many bridges, both recently constructed and those being constructed, across the Yangtze as we traveled downstream. The Danning River Bridge, at the entrance to the Lesser Gorges, will be submerged when the TGP is complete. The most unique bridge was in the city of Wuhan, where a large arched suspension bridge is also mounted as a draw bridge.